Is Microsoft's grand vision finally approaching fruition? Phones have had a renaissance over the past half-decade. Gone is the idea that they are used simply for calls and texting, replaced by an all-capable device that can run apps, surf the internet, video call and more. Led by the iPhone in 2007, touchscreen technology and software improvements have meant that phones no longer need a keyboard and can have a large screen and a high pixel density. Other manufacturers, from HTC to Samsung, have added their own take on what makes a "smartphone," redefining the market in the process. Now, it seems that it's Microsoft's turn. 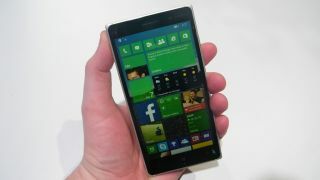 After years of relative obscurity in the world of smartphones – Windows Phone, despite having some good ideas and positive reviews has never been a commercial success – Redmond has decided to take a different tack, incorporating its weakest asset into the biggest: Windows Phone has now become Windows. Previously, Windows Phone was similar in design ideas to Windows 8 but was never actually one and the same thing. There was always the promise on the horizon that the two would merge and apps created for one would work on the other (an idea that I argued would not shift the fortunes of Windows Phone), but with Windows 10 for Phones Microsoft has gone further and could, if the implementation is right, redefine how we see phones. The implementation is, with hindsight, blindingly obvious: all you need is an HDMI connection, a keyboard and a mouse and your phone transforms into a computer. Windows 10 powers the experience and it's cohesive across all platforms, with apps being useable across them all. Working in Office on your phone plugged into a monitor is exactly the same as it would be if you were using a desktop, meaning that serious work can be done on a phone. There are, of course, caveats that may prevent this from being an immediate success. Microsoft has stated that "new hardware" is needed to enable this feature and no current phone that is eligible for a Windows 10 update complies. Shifting hardware is a mixed bag where Microsoft is concerned with certain ventures, such as the Surface models, gaining relative success. The acquisition of Nokia makes far more sense in this light, despite the fact that it's losing money annually, as the company now has a foothold in the PC market. They would, as Steve Jobs liked to say, own the "whole widget". Whether the need to upgrade to get Continuum will alienate current Windows Phone users remains to be seen, as does the problem of whether the feature is enough to warrant the purchase of a phone. Microsoft's suggested use case of new phone buyers mainly applies within developing nations, many of whom do not have £600 (or $600) to spend on a handset, even if it does rule out the need to buy a PC. These niggles aside, if Microsoft can make this work the firm will be in a position that few others are in: they will have cracked the smartphone/PC divide, streamlining the experience and reaping the rewards.